Vidyut Jammwal is returning to the big screens with his next film, Junglee. The trailer of Junglee was pretty good and the songs that have come out so far have been a visual treat. A new track from Junglee titled Garje Gajraj Hamare is out and it is sung by Navraj Hans, Hamsika Iyer, Abhishek Naliwal and Gulshan Kumar and the music is by Sameer Uddin. It also stars Pooja Sawant and Asha Bhat. The song begins on a high note and will have your attention right from the start. 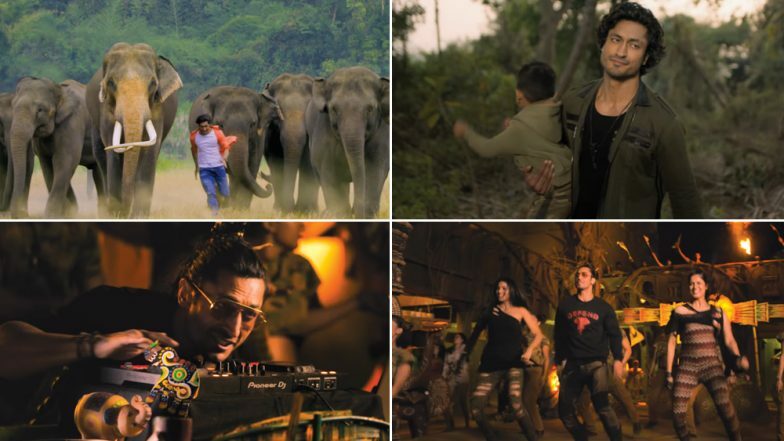 In the video, one can see Vidyut and his junglee friends trying their best to save the jungle and the elephants from the enemy. They're making all the noise they can to keep the enemy at bay. For all those who have missed seeing Vidyut showcase some kickass stunts, this video will definitely not disappoint you. Vidyut Jammwal Takes Daredevilry To the Next Level in His Upcoming Action Film Junglee. The story of Junglee is about a man (Vidyut) who has a special connection with his elephant friend in the jungle whose name is Bhola. There are a couple of songs which portray how friendly they are with each other and we must say, Vidyut shares a great equation with the elephant. In fact, in an interview earlier, the actor had revealed how he spent some time with Bhola before they began shooting just to get him know better. Junglee Song Fakeera Ghar Aaja: Jubin Nautiyal's Soothing Voice Makes This Vidyut Jamwal and Pooja Sawant Number a Soulful Melody - Watch Video. Junglee looks like a decent watch and all those who love elephants should definitely go and watch the movie. Backed by Junglee Pictures, it is directed by Chuck Russell, who has helmed Hollywood films such as The Mask, Eraser and The Scorpion King. The movie is all set to release on March 29, 2019.